Jamie Fristron has worked on a lot of games during his time in the video game industry, but he says that his most well-known creation was the web-slinging system in Spider-Man 2. 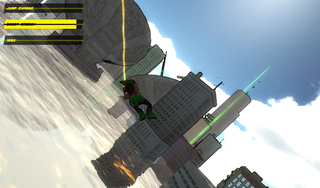 Now, he's making a new game called Energy Hook that combines Spidy-style rope-slinging with jetpacks and extreme sports. Okay then! The key to Spider-Man 2's traversal was that you had to actually anchor your webs to buildings, unlike in other Spider-Man games, where you could just sort of attach webs to the sky (yawn). Energy Hook works with much the same system, albeit with a notable lack of radioactive spiders. You can see a breakdown of how the game'll work in the video here, which is a pitch for the game's Kickstarter crowdfunding drive. As I’ve been working on this game I’ve fallen in love with it, and I’m going to finish it, no matter what, even if I don’t raise a dime. Now, since I went indie years ago I’ve been bleeding money, and I don't know how much indie resolve I have left. And having a family to support, it would be irresponsible of me to keep working on the game for too much longer or blow what’s left of our savings on it, which is why I’m trying to raise some money—to get an idea of how much people want this game, and find out how much more time and money I can responsibly spend. Okay, I guess that makes sense. Anyway, the game looks pretty cool. For more info, head on over to the Energy Hook Kickstarter page.